This status quo no longer makes sense, now that carriers are deploying 5G wireless, which will support higher speeds and lower latency, Fuetsch argues. Wireless network traffic is expected to skyrocket, but carriers cannot afford to increase the price of service commensurately. AT&T previously released specifications for a white box router for use in its 5G network and invited vendors to submit proposals to build the router. 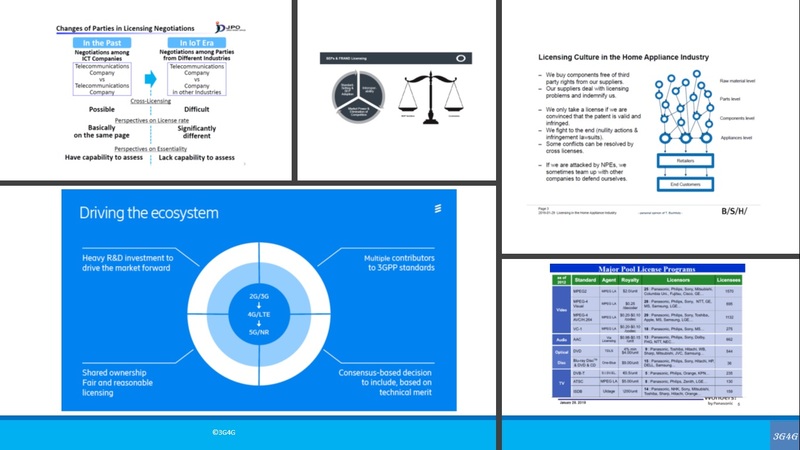 Feutsch’s blog post notes that the company is working on additional hardware specs with the O-RAN Alliance, an industry group focused on defining 5G white box requirements. The other AT&T 5G white box initiative highlighted in Fuetsch’s blog post is something he calls the “network cloud white box,” which he said is now live in the AT&T network and carrying 5G traffic. This device would be a switch that would interconnect servers in the edge data centers that AT&T is establishing to support low-latency 5G wireless applications. Some of these applications need more processing power than end-user devices can support, which dictates a cloud approach. But the cloud resources must be located near the end-user to provide low latency. Also in the blog post, Fuetsch noted that AT&T has deployed white boxes in Toronto and London to support internet service for business customers and that the company plans to offer the devices in 76 countries by the end of the year. In addition, he said AT&T is working on technology that would enable a single fiber optic wavelength to carry 400 Gbps. For its 400G deployment, AT&T expects to use Open ROADM optical networking for interoperability, to achieve more competition, mix and match between vendors, and lower the barrier to entry for startup vendors, Fuetsch said. “These white boxes and open source routing software that we’re deploying, the cell site router initiative that we’re putting in is going to 65,000 (domestic) cell sites over the coming years,” Fuetsch said. AT&T contributed its white box specs to the Open Compute Project last year, which led to the development of the cell site router gateway that it’s showing at ONS this week. AT&T is demonstrating a white box router gateway from UfiSpace that was developed via the OCP specifications. Fuetsch said AT&T planned to update 65,000 cell tower sites with the UfiSpace white boxes. While he didn’t provide a timeline, he said those efforts were ramping up this year. While AT&T hasn’t said which vendors it’s using for the internet white boxes, AT&T is running its Vyatta software stack on them, which Fuetsch said AT&T still planned to contribute into the Linux Foundation’s DANOS community at some point this year. These open, white box systems allow AT&T to run 10 times as much traffic as the proprietary routers it previously bought at the same price. Fuetsch declined to give a time frame for when a majority of AT&T’s network might operate on open source-based hardware, but said certain aspects of it will in the coming years. Regarding AT&T’s motivations for open source, Fuetsch identified security, freedom of choice, flexibility, and interoperability. “As we shift from a hardware-centric network to a more software-centric network we needed a way to get our software to become more open, more flexible. We also were looking for software that’s more secure. Open source is inherently more secure because you have more eyeballs on it,” he said. AT&T CEO Talks up 5G: Deploying small cells, China/Huawei – Security or Critical U.S. Infrastructure Risk? AT&T CEO Randall Stephenson said China still lags behind the U.S. in the 5G race (for dubious reasons- see comment in box below this article), but slow cell site permitting processes in the U.S. and heavy Chinese investment, coupled with Huawei’s 5G dominance, could change the situation. Also, European carriers that use Huawei equipment in 4G networks are unable to switch suppliers for 5G networks because “Huawei is not allowing interoperability to 5G-— meaning if you are 4G, you are stuck with Huawei for 5G,” said Stephenson during an interview with Carlisle Group co-founder David Rubenstein at the Economic Club in Washington DC. “When the Europeans say we got a problem — that’s their problem. They really don’t have an option to go to somebody else…To me, the biggest risk is not that the Chinese government might listen in on our phone conversations or mine our data some how if we use their equipment. That’s not the issue,” he said. Stephenson is worried about how the 5G equipment could eventually be connected to millions of devices tied to critical U.S. infrastructure — including autonomous cars, manufacturing floors, robotics, refineries and traffic management in cities. “We have to ask ourselves a question: If that much of our infrastructure will be attached to this kind of (5G) technology, do we want to be cautious about who is the underlying company behind that technology? We damn well better be,” Stephenson said. But in a 5G world millions of “things” will be connected and located within a square mile. To make that possible, AT&T will deploy hundreds of thousands of small cell sites throughout the U.S. They will be placed on light poles, sides of buildings, roof tops and other structures. According to the AT&T CEO, 5G is a more efficient technology, delivering a better smartphone user experience, but it won’t be cheaper than 4G. AT&T has not “worked out what or pricing arithmetic looks like,” Stephenson said. We carry around these devices and they’re bigger than they should be, because there’s a lot of computing in here, there’s a lot of storage in here. When you get to 5G, all that computing, all that storage goes away — it’s back in the network. These form factors, some would say they shrink. AT&T is right at the very center of all this because, if you ask yourself: Five years from now, in this room, will you be consuming more or less global bandwidth. More? Who thinks more? Will you be consuming more or less premium entertainment? More? Well, I like where we are on both of those. You can watch and listen to Stephenson’s 52 1/2 minute talk here. 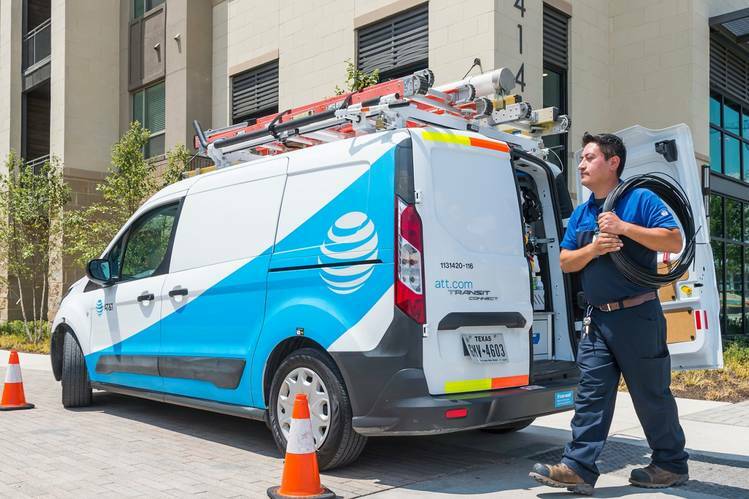 AT&T says its leading wireless and fiber network, including investments in new technology such as 5G, will provide the network bandwidth required as customers increase engagement with premium video and emerging 4K and virtual reality content. AT&T is now a software company: “Software is increasingly at the heart of everything we do. Whether a patent or an open source project, software is the future of AT&T. Software is our thing,” AT&T’s Mazin Gilbert wrote in a blog post. AT&T announced at MWC 2019 that it is working with Microsoft on a proof of concept to integrate network edge compute (NEC) capabilities with its 5G network and Microsoft Azure cloud services. The solution would be important for the industries and Internet of Things (IoT) use cases of retail, healthcare, public safety, entertainment, and manufacturing, AT&T said, as it would provide businesses with lower latency, access to high compute power, and network routing without needing on-premises hardware. “We’re testing our ability to substantially reduce latency and improve user experience by deploying advanced cloud services in specific geographic locations closer to business sites. A fully-scaled deployment will give businesses access to compute power, lower latency and optimized network routing without the need for dedicated on-premises hardware.” These advantages will be important for the low-latency cloud and IoT solutions used by retail, healthcare, public safety, manufacturing and entertainment. Last month, AT&T* announced its approach to 5G for businesses, laying out three key pillars: mobile, fixed and edge computing. “Our collaboration will pave the way to enable Microsoft Azure cloud services to connect to more customers and devices across the US through AT&T’s nationwide wireless network,” Microsoft corporate VP of Azure Networking Yousef Khalidi said. “Our two companies are working together to achieve the low-latency connectivity needed for the explosion of devices and immense amount of data being created by computing at the edge,” he added. AT&T is using drones to test the network edge compute capabilities with Azure, working with Israel-based startup Vorpal in its foundry in Plano, Texas. Vorpal’s VigilAir product detects and geo-locates drones in real-time, which could be used by law enforcement agencies and airports. “By running their VigilAir application using Azure cloud services delivered through the Plano AT&T test environment, and connecting their drone-tracking sensors using AT&T LTE and 5G networks, Vorpal could achieve the low latency and compute scalability required,” the carrier said. AT&T expects to share more details about NEC services with Microsoft Azure later this year. NEC is part of AT&T’s broader edge compute strategy that also includes AT&T Multi-Access Edge Compute (MEC). Earlier at MWC 2019, AT&T announced it’s working with Vodafone Business on IoT applications for the automotive space, including safety, security, and entertainment. The two companies said they would develop connected car solutions across 5G and autonomous vehicle technology; vehicle-to-everything (V2X) capabilities; in-vehicle entertainment; connected car applications and services; global service quality models; and the intersection of connected cars and smart cities. AT&T will shut down its 3G network in early 2022 as the company shifts its focus to 5G implementation (?) and compatible 4G LTE networks. Research firm Ovum estimates that the number of devices using 3G exceeds 85 million, while AT&T reports that 3G was still the choice for 11% of the company’s postpaid users last year. AT&T’s decision to shutter 3G, disclosed in a Wednesday regulatory filing, follows rival Verizon Communications’s warning that it will disconnect 3G cellphones at the end of this year. Verizon said in a recent filing it is “aggressively refarming 3G bands” for 4G but still needs more spectrum to keep up with its users’ demands. Verizon executive Ronan Dunne told investors at a Thursday meeting that its 5G service will reach 30 cities this year. AT&T’s 5G service touched parts of 12 cities at the end of 2018, with nationwide service expected in 2020. The demise of 3G in the U.S. has been all but certain after cellphone carriers spent billions of dollars over the past decade to blanket the country with 4G service. That standard, also known as long-term evolution, or LTE, allows users to download data 10 times as fast as its predecessor and has paved the way for many smartphone apps that require ample mobile bandwidth. Winding down obsolete versions is a habit for telecom companies. In the 1990s they pushed analog cellphone users to the first digital standards, and later persuaded 2G users to upgrade to one of several wireless technologies with the 3G label. The companies are driven by necessity. Cellphone users with unlimited data plans stream more video on the go, testing the limits of what service providers can handle. Getting customers off 3G allows carriers to free up wireless frequencies for 4G signals over broader swaths of the radio spectrum. Early 3G phones kicked off the smartphone era by giving customers a reason to use their devices for more than just talking and texting. Apple Inc.’s cellphone sales took off after it launched the iPhone 3G. AT&T said 11% of its postpaid customers were using 3G service at the end of 2018. More than 85 million devices use 3G, according to research firm Ovum. They include smartphones, tablets and devices like vehicle-location trackers. The coming changes could also affect users of prepaid cellphone brands like TracFone that use other companies’ networks. Telecom executives are already shifting their attention to the latest group of engineering standards known as 5G, which are expected to make video streaming and downloads even quicker. The specifications also support many more connections at once, allowing carriers to go after more types of gadgets. The end of 4G LTE service, if it comes, is years away. ITU-R  and ITU-T haven’t finished writing 5G standards, and telecom companies say it will take years to make 5G commonplace. Companies are less motivated to kill 4G service because it can work in tandem with 5G, unlike previous generations that forced carriers to devote a band of wireless spectrum to one technology. Note 1. An AT&T representative chairs ITU-R WP 5D which is responsible for the IMT 2020 (official 5G) standard. Another AT&T rep chairs the WP 5D SWG on Radio Aspects within the Technology WG. Hence, AT&T has tremendous influence and impact on IMT 2020 yet it’s marketing communications department falsely claims the company has deployed “standards based” mobile 5G. § NGMN actively drives global alignment and convergence of technology standards and industry initiatives with the objective to avoid fragmentation and to guarantee industry scale. § A global presence has been established that comprises a leadership network of about 90 Partners: Operators, Vendors, Software Companies and Universities. These Partners are contributing to and delivering the results of the Work Programme with a focus on 5G. Several Cooperation Partners support the NGMN Alliance by two-way liaison statements. § The 5G Eco-System is different! New use cases beyond mobile broadband like massive IoT as well as highly demanding requirements from Vertical Industries on low latency, ultra-high reliability and security are causing substantial network transformation. Service Based Architecture, Network Slicing as well as Network Function Virtualisation are the solutions with major impact on network architecture and operations. In the communications segment, AT&T’s largest business, the carrier and media giant gained a net 134,000 phone subscribers who pay a monthly bill, falling far short of analysts’ estimates of 208,000, according to research firm FactSet. AT&T has 153 million total phone subscribers. Churn, or the rate of customer defections, was 1 percent during the fourth quarter, up from 0.89 percent the previous year. During the Q&A session Stephens added: “We’re seeing the effects of 5G evolution be real and in customers hands today which is making a difference. We do have about 450,000 FirstNet qualified customers from about 5000 organizations or departments that have signed up for it. A significant amount of those early adopters were migrations, so maybe close to two thirds or 60% or so, but we are now getting a lot of new ads. And as this build out gets passed the existing 40% in the 50%, 60% and 70% so to speak as we continue make that progress, I think you’ll see us begin to grow that new customer share and numbers significantly. AT&T’s revenue of $47.99 billion missed estimates of $48.5 billion. AT&T also reported net additions of 134,000 phone subscribers, below analyst estimates of 308,000. The company also lost 403,000 satellite TV subscribers and 14 percent of its DirecTV Now streaming subscribers in the quarter. Bank of America analyst David Barden said that, despite the quarter’s shortcomings, AT&T is moving in the right direction. “Within the wireless business, which accounts for 50% of total EBITDA, service revenue grew, net adds were positive, and EBITDA beat by a material amount as the handset upgrade rate was much lower than expected,” Barden wrote. Raymond James analyst Frank Louthan said AT&T is prioritizing deleveraging its balance sheet in 2019 and should be able to hit its 2.5 times target by the end of the year. “We believe the video sub trends will be offset as marketing packages with mobility and FirstNet take hold and drive improved profitability per sub, but this could take time for investors to see the signs,” Louthan wrote. Morgan Stanley analyst Simon Flannery said there were some encouraging signs for investors in the fourth quarter, but AT&T has limited near-term financial visibility as it digests its Time Warner acquisition. AT&T Communications CEO John Donovan and MediaLink Chairman and CEO Michael Kassan explored 5G and its potential opportunity for robotic manufacturing, AR/VR and mixed reality, sporting experiences, public safety and beyond. Evidently, John Donovan isn’t concerned about the criticism that his company has faced for updating some 4G-LTE phones to display the 5G E label, a move that competitors are calling misleading for customers. Nor is he concerned that AT&T’s description of their so called mobile 5G deployed in 12 U.S. cities last month is: “standards based,” when it really is not. A video stated:”AT&T is the first to deliver standards based mobile 5G.” In fact, it is neither standards based or 5G as per ITU-R WP5D or 3GPP (which is NOT a standards organization). “If I occupy beachfront real estate in my competitors’ heads, that makes me smile,” Donovan on Wednesday told CES attendees during a keynote in Las Vegas. HIs comments came one day after some customers discovered that their phones had changed from reading LTE to 5G E, which stands for 5G Evolution. The move, which caused some confusion, was meant to indicate that the phones were now accessing a network twice as fast as 4G LTE, Donovan said, and one that would pave the way for 5G. The 5G Evolution network is currently available in hundreds of markets for certain phones. Donovan said it is a stepping stone to the fifth generation of wireless technology and is twice as fast as the 4G LTE network that most mobile phones connect to, though still not as fast as 5G will be. Donovan wrote off the criticism as frustration from competitors over AT&T’s “5G” advancements. In the fall, the company announced that it would make a mobile 5G network and mobile 5G devices available to consumers by the end of the year. In December, its pre standard mobile 5G network went live in 12 cities. Even with AT&T’s 5G work, it could be years before most Americans connect to 5G on their mobile phones. Donovan said, “the (5G) network wont be as broad geographically as to be a consumer benefit.” Therefore AT&T will concentrate on industrial users such as enterprise campus and in building wireless networks. While Donovan did note that “media will be most transformed” by 5G technology, he shared a number of different industrial use cases. The AT&T executive said that 5G could be used to update billboards in real time and make them personalized based on the interests of drivers. 5G will also be instrumental in making mixed-VR headsets like Magic Leap, which AT&T has invested in, usable in mobile environments. He also referred to a new partnership with the Dallas Cowboys, but did not elaborate. Rush Hospital in Chicago was another 5G partner Donovan noted. “Those are front burners, rather than downloading a movie faster,” he said. Whew! I don’t have to hold my breath any longer! But is it really 5G? And whom other than stadiums/parks will buy it with only a single end device offered- a WiFi hotspot? Please see Author’s Closing Comments below, which refute that “standards based” claim. We’ve repeatedly pounded the table that 3GPP Release 15 NR NSA is not 5G and nothing that comes out of 3GPP is a standard (as per their own website!). As expected, AT&T’s initial 5G launch will use mmWave spectrum , which is claimed to offer users a faster mobile experience than standard LTE. The 5G service starts small and will be limited. AT&T’s mobile 5G network is live in parts of 12 cities: Atlanta, Charlotte, N.C., Dallas, Houston, Indianapolis, Jacksonville, Fla., Louisville, Ky., Oklahoma City, New Orleans, Raleigh, N.C., San Antonio and Waco, Texas. Note 1. Millimeter waves occupy the frequency spectrum from 30 GHz to 300 GHz. They’re found in the spectrum between microwaves (1 GHz to 30 GHz) and infrared (IR) waves, which is sometimes known as extremely high frequency (EHF). The wavelength (λ) is in the 1-mm to 10-mm range. In the first half of 2019 AT&T plans to deploy mobile 5G in parts of these 7 additional cities: Las Vegas, Los Angeles, Nashville, Orlando, San Diego, San Francisco and San Jose, Calif. The company says that as the 5G ecosystem evolves customers will see enhancements in coverage, speeds and devices. Early adopters will only have one choice of end user equipment: the NETGEAR® Nighthawk 5G Mobile Hotspot (aka “a puck”) on the mobile 5G+ network. AT&Ts 5G service will start out in dense urban areas. Through an initial offer, AT&T says they will deliver select businesses and consumers their first mobile 5G device plus 5G data usage at no cost for at least 90 days. Next spring, customers will be able to get the Nighthawk for $499 upfront and 15GB of data for $70 a month on a compatible plan and no annual commitment . AT&T said its hot spot and the data it uses will be free for subscribers in the first 90 days of the rollout. After that period, the device will sell for $499 with a 15-gigabyte data plan priced at $70 per month—a rate slightly cheaper per-datum than the 10-GB for $50 it offers with 4G LTE hotspots. An AT&T spokesperson said businesses and customers in the initial rollout areas can express interest in joining the early phase of the network on the company’s website. The spokesperson also said the network should eventually reach theoretical peak speeds of 979 megabits per second, but actual average rates will be lower. In December, AT&T announced two 5G-capable smartphones for 2019. A Samsung-branded 5G smartphone operating on AT&Ts mmWave is will be released in the spring of 2019. Toward the end of 2019, AT&T will release another Samsung 5G smartphone with multi-frequency band support. None of those devices will meet the still uncompleted IMT 2020 standard for mobile 5G (see Closing Comments below). Note 2. The NETGEAR Nighthawk device will require a 5G compatible AT&T data plan. Device availability and 5G+ coverage areas are limited. Expect to hear more about 5G soon at events like the big consumer electronics trade show CES in January in Las Vegas and MWC Barcelona (formerly the Mobile World Congress) in February in Spain. Wireless service providers including AT&T and Verizon are already talking up 5G. And device makers are previewing gadgets that will work with the technology. Samsung recently demonstrated prototypes of 5G smartphones that are expected to operate on both Verizon and AT&T networks. Many other manufacturers are racing to follow suit, though Apple is not expected in the initial 5G wave. Analysts predict that iPhones with the new technology won’t arrive until 2020. Qualcomm, the wireless chip maker, said it had demonstrated peak 5G download speeds of 4.5 gigabits/second, but predicts initial median speeds of about 1.4 gigabits/secon. That translates to roughly 20 times faster than the current 4G LTE experience, but is much lower than IMT 2020 objectives for peak and average bit rates. The 5G speeds will be particularly noticeable in higher-quality streaming video.Downloading a typical movie at the median speeds cited by Qualcomm would take 17 seconds with 5G, compared with six minutes for 4G. When AT&T introduces its “5G” FWA residential service it will be based on LTE, according to Mr. Burke. In answer to a question from this author during the Q&A session, he said it would start as LTE but then transition to 5G NR based FWA. The spectrum to be used was not revealed by Mr. Burke, but it will likely be mmWave (like Verizon’s 5G Home). How long can AT&T claim their “5G” network is standards based when they only support 3GPP release 15 “5G NR” NSA access with a LTE core network and LTE signaling? The ONLY 5G RAN/RIT standard is IMT 2020 which won’t be completed till the end of 2020. AT&T knows this well because one of their representatives is the Chairman of ITU-R WP 5D where IMT 2020 is being standardized. Wireless telcos are counting on 5G’s capabilities to broaden their customer base beyond phones to new machines like driverless cars and factory robots. AT&T executives are so enticed by the promise of mixed-reality goggles, which superimpose images in users’ field of vision, that they invested in visor maker Magic Leap to help develop a market for the devices (see below for details). AT&T is in a race to launch 5G services faster than its rivals, though each is taking a different path to get there. Verizon Communications tried to get the jump on its competition with its own pre-5G (fixed wireless broadband) standard. AT&T directed its research toward internationally recognized specifications (i.e. 3GPP which is not a standards organization)—hoping that doing so will make its service more adaptable as the technology matures. The chief executive of AT&T’s communications division, John Donovan, spoke with The Wall Street Journal about AT&T’s plans for 5G, among other things. Here are edited excerpts of the conversation. WSJ: There’s been a lot of talk about 5G technology. When it comes, what will it look like? MR. DONOVAN: You’ll start to see handsets rolling out as early as the first quarter of 2019, but much more probably and in more volume when you start to look at the back half of ’19. Things will be compatible with not only 5G but also all of the prior generations. With nonstandards technology, [that kind of backward compatibility] is not typically the case. That’s why we didn’t waste too much time on the nonstandard version like some of our competitors. WSJ: It sounds like there’s a bit of a chicken-and-egg problem. If you don’t know what consumers are going to want 5G service for, how do you know where to build the network first? We’ve made two announcements so far. One is in robotic manufacturing in Austin, Texas, with Samsung. And we have an exclusive for the Magic Leap mixed-reality goggles. The speed of 5G means the next generation of goggles will be smaller, lighter and cheaper. When we did the announcement with Magic Leap, one of the things we announced is that DirecTV Now will be one of the apps available on the goggles. So, you put the goggles on and you can project four televisions onto the wall. It’s mind-blowing to think about creating an 80-inch television from a set of goggles. WSJ: When 5G comes to my cellphone, am I going to pay more for a plan? MR. DONOVAN: That’s to be determined. I think that’s something that collectively the industry’s going to try to innovate around. When we went from megabits and text-message plans to unlimited in the 4G network, there wasn’t a lot of incremental revenue. But 4G dropped our costs dramatically, so it improved our margins. With 5G, you can never call these things until you get into the marketplace. Most would say now that it’s going to carry a premium because it’s so superior in some of the things it can do. But that premium may be that you have three new devices in your home that have small connection fees, and not necessarily that you have an iPhone in your hand and the plan it’s on costs more. WSJ: Looking back on past generations of wireless, as networks mature, it gets harder to tell the networks apart, at least in the consumer’s mind. How do you try to distinguish yourself from the other guys? MR. DONOVAN: Generally, we’ve hit a point with networks that there’s “good enough.” The analogy I use is oxygen. You’ll notice if it’s not there. But if it is there, in its highest state it’s invisible. How do you make it visible? Your people. I love the idea when it’s about the people in the stores, the call centers, your sales rep. We’re more likely to win in a world differentiated around people than marginally differentiated by machines. WSJ: Should the number of stores be growing? Do you think we need more places to buy phones? MR. DONOVAN: Yes, but I don’t want to build a store that you have to go to. I want to go to where you already are. So, if you look at our retail growth this year, it’ll be in kiosks, pop-up stores and trucks. If you’re in a brand new [apartment] and you want to deal with fiber and a family plan and television, wouldn’t it be great if you had a pop-up store that’s in the lobby right near the leasing office, you can get all of that stuff done, and a year later the store is gone because the building’s leased up? The future of retail is that you need to be where the people already are. The idea that you’re going to run a television commercial, have them get off the couch and go call an 800 number, or get off the couch and go to a store, is no longer the case. Those two things didn’t even exist five years ago from a standpoint of how we marketed. Mr. FitzGerald is a Wall Street Journal reporter in Washington. Emaildrew.fitzgerald@wsj.com.